Per request. This one is buffered effect, so you'll need just 2PDT stomper. Original unit has two NEC C251Cs in it and if you really want, you can score those for ~6 USD a piece from evilbay. 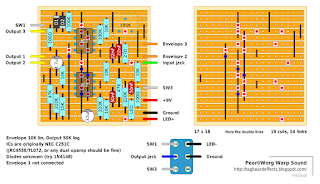 However, the build reports state that any dual op-amp will work just as well. It should work just fine with JRC4558, TL072, NE5532 and so on. THANKS a lot Miro, I waited so long for this pedal! I need to build it next week. Thanks Miro, you made my day! Hope to do soon! I need to use a rev log pot! Just noticed that fixing the IC cuts - i made a new error in there. There's no double link marks. I'll fix that tonight. Blue dots on the cut board. Component layout is the same, but the cut guide.. The demo, sounds like a lot of the effect happens in the last 3rd of the pot rotation, would using a log pot help it sweep better? I have a good idea for a mod. 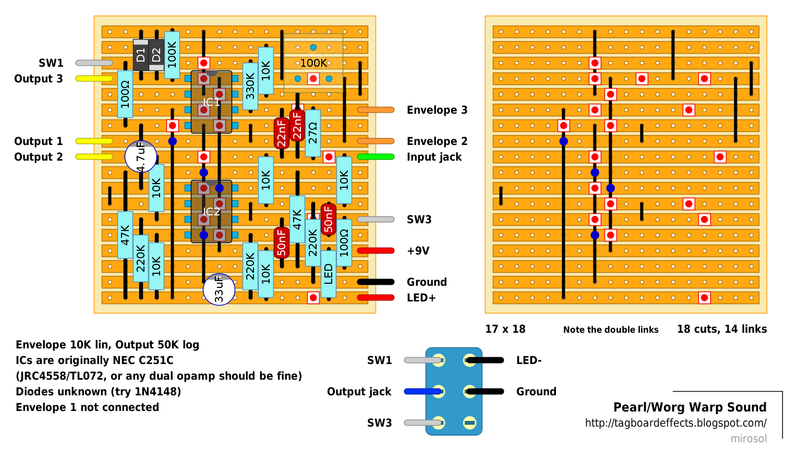 If you used a DPDT on-on switch, you could switch between using the pot to control envelope or using a 10K LDR to effectively make it a wah pedal. I will give this a go when i have the parts. If anyone else tries it let me know. So I remember reading that the 100k trimmer here controls the amount of fuzz? Is that true? I think that is correct but i'd wait for Mark or Miro to chime in. If we want use with true bypass, what we have to remove? Simplest way would be to use SW1 as output. Removing the buffer components - not so simple. It's what I thinking, thanks for your confirmation! Hello guys, Without including extra modifications, could be this project consider as verified? I plan on building it tomorrow, I actually bought the original ICs a while ago :) Will report back! I'm going to build this tomorrow evening so hopefully I'll have a possible verification for you. I'm looking to build more filter type effects so this should be a nice start. WOOHOO my 2nd verification, you can tag this one. I used tl072s for the opamps and its a really nice sounding thing. One mod, use a C5k instead of B10 for the envelope pot, with a b10 there is too much low end and a funny sweep, c5k cuts some of the bottom end and makes the sweep much more useful. Thanks for an excellent layout. Firstly, the wires that connect the envelope pot to the board, dont connect them to the pot, instead, solder one to lug 2 and one to lug 5. Then solder a small piece of wire to connect lugs 3 and 6. Next, take one leg of the ldr and solder it too lug 1 and solder the other leg to lug 4. Now you will have a normal warp sound pedal in one position, using the pot to control envelope, in the mid position the pedal becomes a strange bassy synnthy fuzz pedal and in the other position the envelope is controlled by the ldr. Et voila! Hi there, really looking forward to building this - just a little confused as to the LED wiring which shows as a red LED + coming off the board. Should that in fact be connected to the LED minus on the foot switch? Am now so far into the build - the more I look over the layout, the more confusing it becomes :/ is the LED in the bottom right actively used as a Diode? and an additional LED to be wired between the Red LED+ to the SPDT Black LED- on the foot-switch for on/off indication? ... a brain racking arrrggg! - Mirosol please help! Need a little help. I built it and the filtering / envelope is working but the signal is only the slightest bit distorted. It's almost clean. In what I've read there is a lot of mention of driving this with another pedal like a distortion and when I do that it sounds like the demos. If used by itself will this act as a fuzz or just a supplemental filter? Ok, if it doesn't generate fuzz then it works fine. Although, I don't believe it's an auto wah. The filter doesn't oscillate. It remains in a fixed position. I'm thinking about making a multi filter unit with this, a harmonic energizer and maybe a sound saw. Yeah my bad, not an autowah, just a filter. Kinda like a fixed wah but more synthy filter style. It can be fuzzy when you crank the trimpot. Ideally, put it out as a full pot and you can control it. The no-brainer mod for this one is an expression pedal for the envelope. A Roland EV-5 has a 10K pot so it works perfectly, just connect the two envelope connections to the middle of a dpdt, then have it choose the lugs of the pot or the + and - of a mono jack. Adds so much to the pedal, i'd never even want to play it without an expression pedal.